Ideal for areas where Areas in which there are easily ignitable fibers or flyings present, such as textile mills, and any plant that creates sawdust or shavings. Meets requirements for Class I, Division 1 & 2, Groups C and D. Class II, Division 1 & 2, Groups E, F and G, and Class III areas. 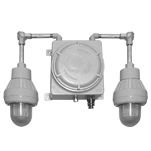 Available in many configurations to suit the needs of a range of applications, these self-contained fixtures for hazardous locations are available with a 6V or 12V battery, up to 40W.